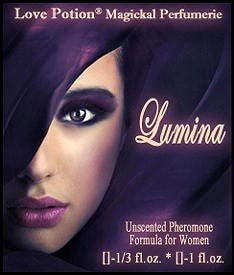 For accentuating that precious 'glow' of femininity ~ attractiveness, sparkle, happiness, youthful appeal and confidence. Sensual, certainly, but not overtly sexual (just a drop of copulins); safe to wear day or night, anytime or anywhere you want to ILLUMINATE the room! Ingredients: Estratetraenol, Alpha-Androstenol, DHEAS, Epi-Androsterone, Copulins.